Hello friends! I’ve been working on this interview since last Friday so I’m thrilled that today I can share it with all of you. 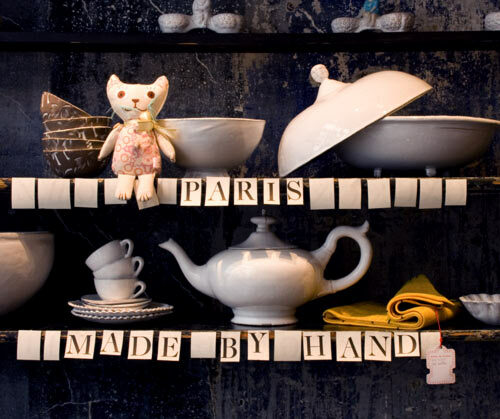 I met stylist, photographer, blogger and now new author of Paris: Made By Hand, Pia Jane Bijkerk, last year in Amsterdam at a small gathering of bloggers. I didn’t know much about Pia before that evening, but upon meeting her I felt as though I’d met a kindred spirit since she’s also passionate about art and design, particularly handmade things, and she really loves to blog and talk about the experience of blogging. From that point on, I started to read her blog regularly and fell in love… and now I follow her work more closely. I was particularly excited when she revealed her new book would soon be published. I know her work is being featured all over the web right now so the challenge for me was to put a different spin on things so as to not repeat content already posted elsewhere. This interview will focus on a more behind-the-scenes look at the life as a stylist and how it all works. The job of a stylist is usually quite secret, not many really share what it is all about and because this frustrates me I thought I’d see if Pia was willing to share the ins and outs of this profession and to my surprise — yes, she was very willing! I’m sure you will love her interview below, I appreciate thorough comments so I didn’t edit out anything for the sake of space… Pia has mentioned to that if you have additional questions that she’ll be glad to answer them so please leave those in the comments section below. Let’s get started, ready? Holly: How did you become a stylist? 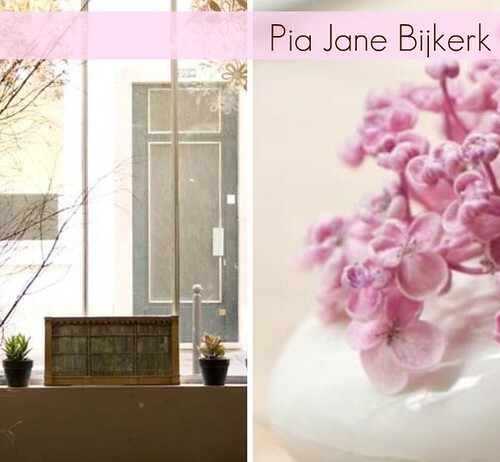 Pia: Well once upon a time, I owned a homeware boutique in Sydney, Australia, selling handcrafted furniture, beautiful handmade homewares, and skin care products from Australia and around the world. I was 21 when I opened it, straight out of university with a BFA in film and photography - I knew nothing about running a store. So it was one big learning curve! I had a lot of fun with it, but decided to sell up shop after 4 years as I felt the financial strain with the slow down in small business retail. So I sold everything in the store, except the pieces that I simply couldn’t part with and took some time off to decide which direction I should go in - back into film and photography, or stick with home wares and interior decorating. During this time off a friend and I were sharing some fish and chips by the waterside for lunch and she turned to me and said, “You know what Pia, you should be a stylist!” And I said, “What is that?” I had no idea what a stylist was, but I was eager to learn all about it. So my friend gave me the number of her friend who was an art director in the industry - I called her and she told me how I could get started. It involved a lot of calling and emailing of photographic agencies, and offering myself for lots of free work as an assistant to stylists. And thats how I got started! That was about 5 years ago now. Holly: Do you remember your first assignment and if so, what was it and how did it go? Were you scared? Was it a success? Did you make mistakes? Pia: Oh yes I remember! My very first assignment as an assistant stylist was for a David Jones catalogue (David Jones is sorta like Bloomingdales or Macy’s in the US), assisting a stylist named Jenni Booth, working for advertising agency Saatchi & Saatchi. I was indeed nervous as I had absolutely no experience in the field plus I barely knew what a stylist did! but the photographic team was really nice and welcoming, and it didn’t take long for me to feel relaxed and be a part of the team. I feel utterly blessed that Jenni was the first stylist I ever assisted as she is without doubt one of the best, and she is also a wonderful, genuine, generous soul. She taught me everything I know as a stylist! and is now one of my best friends. We worked together on a number of catalogues since that first shoot, and when I became a full-fledged freelance stylist of my own, Jenni encouraged and supported me all the way. She became a mentor for how I wanted to be as a stylist. Now, my first job as a fully independent freelance stylist is a rather different story. After assisting and propping (merchandising) for magazines for quite some time I was finally asked to do my first editorial spread for one of my favourite magazines! I was very excited, and I went to great lengths to ensure I had more than enough props to have photographed. I arrived to the studio half an hour early so that I could unpack all my props and lay them out neat and tidy. Boy was I excited! But the photographer was not in the best of moods as it turned out, and all day the photographer picked on the assistant photographer, creating a palatable tension that just grew and grew as the day went on. It was horrible! I was really distracted by it and was so annoyed because it was my first ever editorial story with 8 or so full page photographs, and I wanted it to be the best. But the tension affected my work alot, and even though I managed and it turned out beautiful with rave reviews from the magazine art team, I couldn’t help but feel I’d been cheated. Anyway it was a wonderful lesson! I learnt to be more focused and try not worry about what is going on around me when I’m working - after all, we are all artists working together on one project each time, so there is bound to be some ups and downs, and passionate outbursts here and there. Luckily I haven’t witnessed many since that first job! Holly: What are the 3 best things about your profession and why? Pia: 1. Working and meeting so many different, creative people - I love it! There are so many creative people out there, and I love having the opportunity to meet and work with them regularly, its a real treat. 2. Being freelance and working obscure hours. I have never been a very good 9-5er, as generally my creative juices flow at varying hours of the day, so I love that I have the freedom to let that happen naturally. 3. Props! hmm, yes, i do love to collect pretty things, so being able to keep some of the props i use on shoots is a bit fabulous. Holly: In your book you mention that you have items tucked away for props. 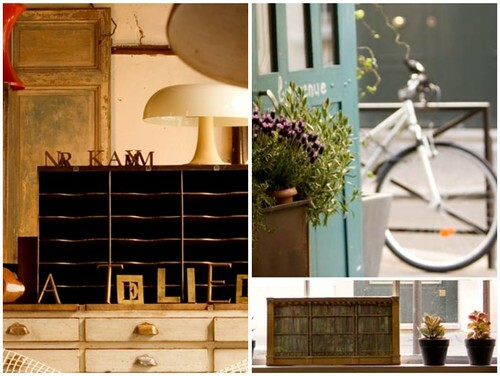 As a freelance stylist, do you have your own studio where you keep props or how does this work? I know you live on a small houseboat so I’m trying to imagine where you keep everything. Pia: Oh my, it is a real problem actually! It does get cramped here on my little houseboat as at the moment it is the only space I have here in Amsterdam, so it’s my studio as well as home. In Sydney I had a large garage where I had everything in labelled, color-coded tubs. To me, that just seems like a fabulous dream right now! Thankfully my partner isn’t allergic to clutter, otherwise we’d be in deep trouble. I would like to get a little studio or at least a storage space, but I’m not sure how to go about that just yet. In the meantime, I have a great friend who puts her hand up anytime I need to off load some of my props. She has a nice big house and much more room than I do! Holly: Let’s play pretend. I call you from a magazine — we’re in need of a stylist for a special trends feature we’re working on. What does the magazine usually do next and then what happens from there? In other words, how does this really work from start to finish? Pia: I have an agency that deals with most of my client requests, so they start the initial contact between me and the client. First they ask me if the job is something I’d like to do and if I’m available for the dates of the shoot. Then they organise a meeting between me and the client, and we talk about what the aim of the shoot is, and what style and look they would like. We would also discuss what else is going on for that particular issue so that I know the general theme, color ranges, and style trends being featured, that way I can help create a cohesive look for the issue, but be as interesting and creative in those parameters as possible. Pia: After that, the fun begins! There is usually no time to go wandering about the town to find inspiration as deadlines are tight and you have to create ‘magic’ before you can blink your eyes! So as a stylist you must have a really good idea of what is already around. If I have an assistant I will give them a specific list of shops to visit and items to pick up, and if I’m on my own I will run around like a madwoman, picking up props from favourite shops, and ‘theming’ the shoot in my head as I go, jotting down ideas in my notepad as I drive/ride my bike/hop on a tram. If I have to have things made, I call my contacts. I always have a list of woodworkers, seamstresses, and set builders in my phone. And if i have to make things myself, then I get all the supplies I need and usually stay up all night crafting away. Pia: Then comes the shoot day! I like to call the shoot day my ‘play day’ - its the day that I get to play with all the things I’ve found. Shoots can be super stressful but I try to make them the complete opposite as I believe that after all the research and hard work that has gone into prepping for the shoot, this is the one (or two or three!) days that everyone needs to enjoy themselves and let their best shine through. And last but not least, we can’t forget the pack up and return of the props. This is probably the least favourite thing to do for a shoot! But you know, every job has it’s undesirable moments. Returning props to shops is not too bad because then you get to visit your favourite shops again and chat with the owners and hear about what new items are coming in. Holly: What moment did you finally realize that as a stylist, you had made it. You know, you were genuinely being taken serious and noticed. When did this start to happen? Pia: To be honest, only recently! I know that’s crazy since I’ve worked with many popular brands and magazines around the world, but moving to Europe was a tough thing to do because I had to prove myself all over again - nobody in the industry knew me at all, where as in Sydney I had great, steady clients and regular work. So maybe just before I left for Europe (2006) I realised I was doing okay - making a living as a freelancer and getting call backs from happy clients - but then it was a bit of a step back again when I moved and now I’m back to ‘feeling it’, in 2009. But you know what? Its more about the regularity of the type of work I do that makes me feel like I’ve ‘made it’, rather than the amount of work. Nowadays I have a lot more choice about the type of work I accept, and - when I do a job that I just adore like when I was asked to write this book - that is when I realise that all the hard work has paid off. Pia: Oh fabulous! I love your clever questions. Let me see… I’m not into sterile environments, so minimalism never really did it for me, but I do enjoy the odd minimalist space, don’t get me wrong - but just not on the front cover of every magazine. So I’m rather glad the ’90’s/nullities minimalist movement is over for the moment. And I really am not a fan of ‘fast interiors’ - you know, ones that are created from just heading down to a mall and copying a catalogue photo. Again don’t get me wrong, catalogues can be super inspiring! But I like individualism, I like seeing people’s personality in their home, like odd things they’ve picked up on their travels, and objects that tell stories. When I buy an interior magazine, I read it just as much for the visual stimulation as I do for the story behind the people who live in this space - I love reading about where people found things, what they do for a living, how they acquired certain items and what their dreams are. I like real stories and not ones that are made up for an audience (I’m a non-fiction gal, what can I say!). So with that said, I love homes that are real and not perfectly styled or perfectly stylish, but super inspiring and dreamy. Holly: What did you want to be when you grew up? Holly: Do you feel your current occupation is one you will stay in forever or do you see other opportunities awaiting you still? If so, care to share what? Pia: Hmm, I think the above answer says it all! I also always wanted to be a writer and a published author, and that is certainly what I am working at now , so for me having my first book published this year is a real dream come true. Holly: What other jobs have you had in your life? Holly: If someone reading wants to become a stylist, what training is required? Pia: The best thing you can do is assist other stylists, its the only training really. Holly: How does one go about getting work as a stylist? Pia: I suggest finding some local photographic agencies who represent stylists (search the internet and blogs for these) and have a look at which stylists work you like. Then email or call the agency to let them know that you would love the opportunity to assist that stylist. If you can, offer to work for free because often a stylist will prefer to trial an assistant first and then they will offer paying jobs if they work well together. Holly: How does someone learn about styling, what classes or books do you suggest they read? Pia: Again I really think work experience as a stylist’s assistant is the best way to learn. 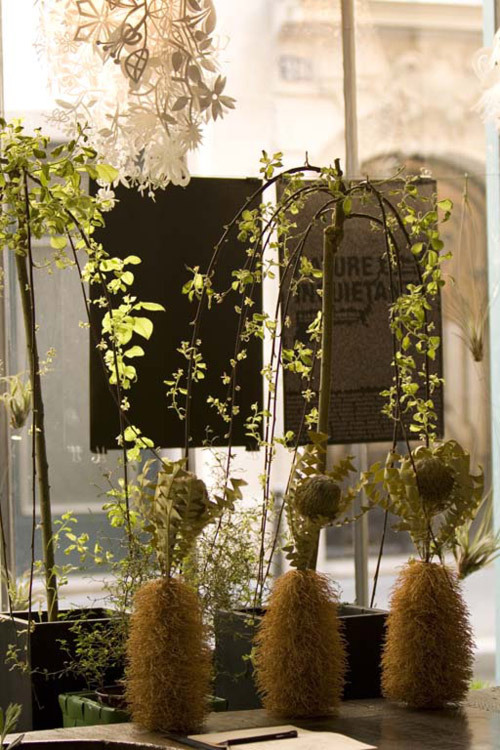 But you can also try creating little vignettes at home, and take the time to get your own particular style going. Then you can see if there are any assistant photographers who might like to do a free test shoot with you and you can get some shots of your work. Then you can begin creating a styling portfolio! 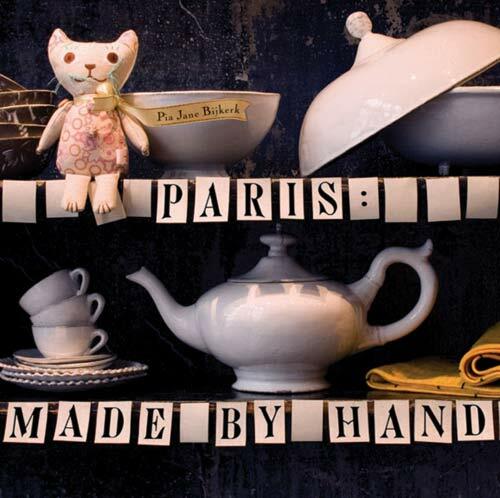 Holly: Now let’s talk for a moment about your new book, Paris: Made By Hand. I finished reading the entire book this past weekend and noticed right away that you took all of the photographs, did all of the styling (of course) and designed the front cover in addition to writing this lovely book. That’s quite an undertaking. How long did it take you to work on this project? Pia: Well from start to finish it was well over a year’s worth of work. But if I was to pick out key sections I’d say the research took roughly 3 months, the shooting and interviewing of all the stores and artists took about four weeks, the writing took a month, and the editing took another month or so. Yes, it was quite an undertaking indeed! But I can tell you, I enjoyed every step of it. Holly: What lead you to authoring a book and will there be more along this theme, perhaps Pia takes Amsterdam? Or? Holly: Okay, how about we show readers how you styled your cover. Sound like fun? Pia: Yes! So for the front cover, I had a good idea of what I wanted to create. 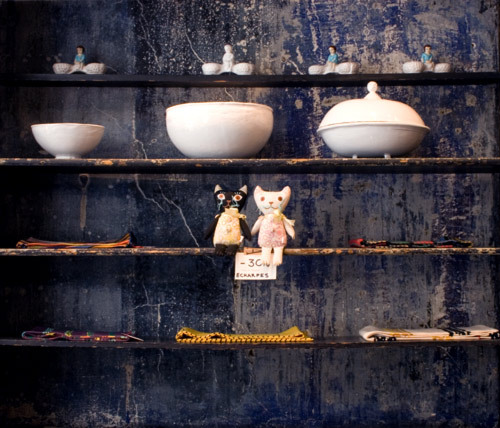 I had seen this beautiful deep blue wall with old shelves in Astier de Villate, a gorgeous boutique which I featured in the book. I went back to Paris especially to shoot the cover in this shop. I made an appointment with the store manager to come just before opening hours, and the light coming through the front windows was perfect. I set up my camera and tripod, and got to playing with the boutique’s handmade treasures! 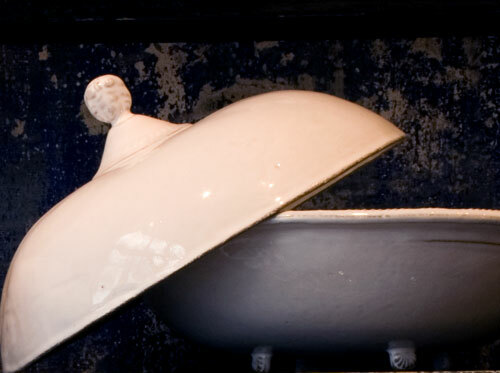 I adore Parisian ceramicist Nathalie Lete’s pieces and I wanted to feature her work on the cover. So I gathered my favourite Natalie Lete bowls and plates from around the store (very carefully!) 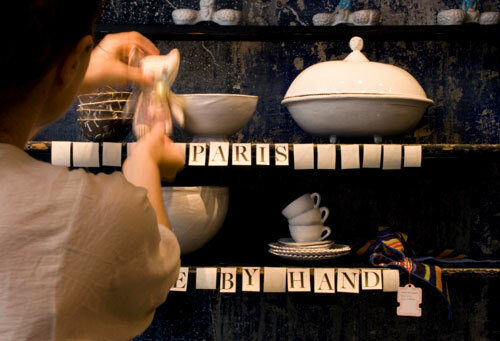 and started to arrange the shelves…. 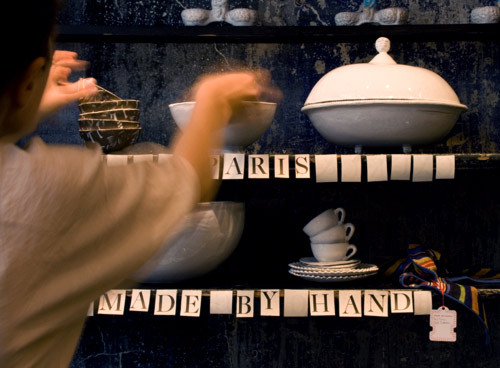 I had bought white paper wrapping with bold type letters and I cut rectangles of each letter out and placed them on the edge of the shelf to spell out the title of the book Paris: Made By Hand. I moved the lid on the top bowl… I stood back, I peeked through the camera lens and thought… that’s it! So I snapped it! And that was that, I was very happy with it. The design team at The Little Bookroom did all the final touches for the cover - they brushed up on the fonts on the paper rectangles so that the title really stood out, and then there was the decision of where to put my name. A few emails with different options went back and fourth and we all decided that we liked the extended ribbon on the kitty. And I really love the yellow accents of the ribbon and the scarf (bottom right corner) against the blue. I hope you to do! I’m so proud of you, Pia and I hope you sell a million copies and become quite famous from it — I’d really like to see a Amsterdam: Made By Hand book! Best of success dear!